The Ultimate no Bake Cheesecake started out in January to be a St. Patrick’s Day post. Cheesecake with a St. Paddy twist. Sounds good, right? Wrong. Total. Fail. Forget St. Patrick’s Day – this was personal now! 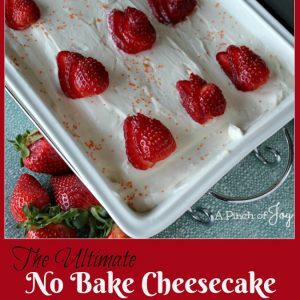 Never one to back away from a challenge, I stirred my way through many cheesecakes searching for THE recipe that tasted great, looked good and came out the same every. single.time. Strangely, my taste testers never complained. They just urged me to keep trying. But that team effort paid off. I created a wonderful baked cheesecake – coming soon. 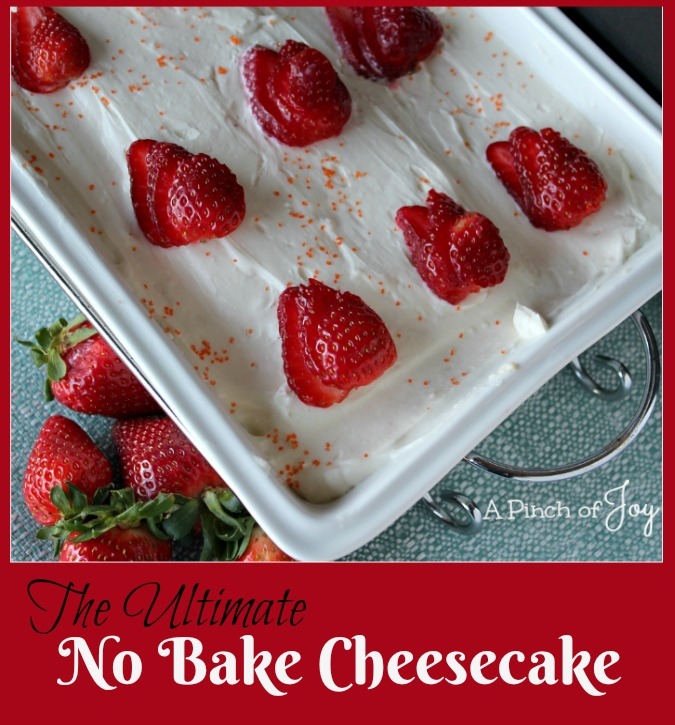 And then this no bake winner! 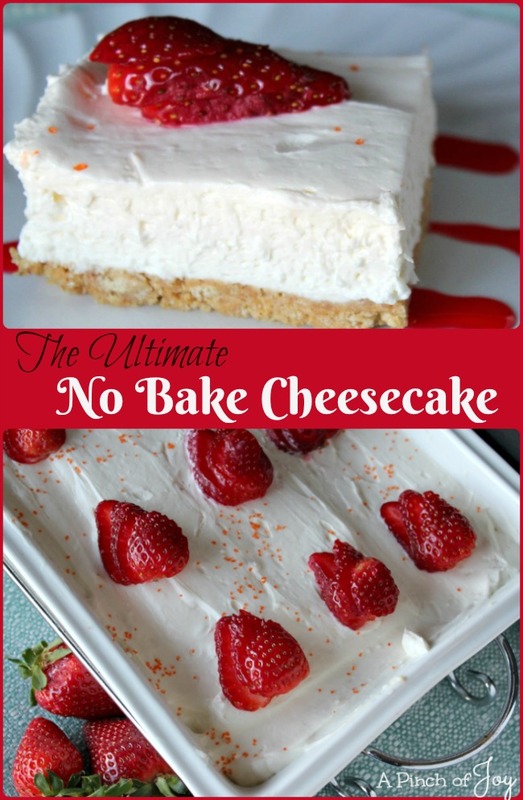 The Ultimate No Bake Cheesecake! This is a soft cheesecake. Meaning, the cheesecake holds its shape well, but does not have the fork firmness especially associated with baked cheesecake. It does have natural ingredients – whipping cream among them — and that makes for a rich, creamy taste. With just right sweetening, it makes the perfect base for fruit – strawberries, peaches, mandarin oranges, cherries, whatever is your favorite. You can stir in chunks of fruit before spreading over the crust or spoon fruit (fresh, frozen and thawed, or made into a compote) over the top of a slice as you serve it. The crust is best if it sets overnight as it will “mature” in both texture and taste. Since I seemed to be making cheesecakes frequently, I bought already crushed graham cracker crumbs. Very convenient. For regular graham crackers, you’ll need 11 rectangular sheets of graham crackers to make one and a half cups of crumbs. 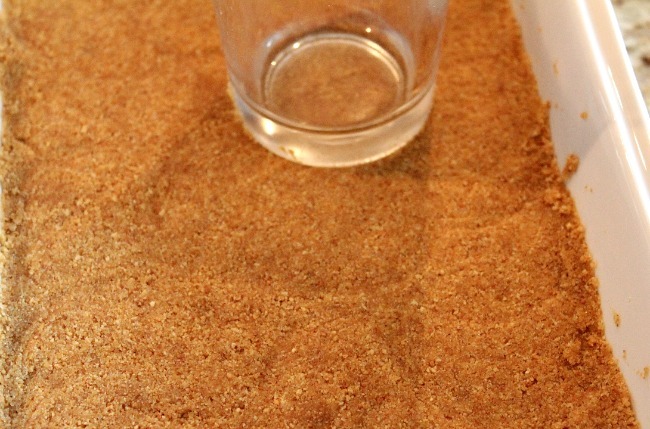 Use a heavy glass or something similar to tamp the crumbs firmly in the bottom of your pan. I use a medium sized casserole baking dish about 7×11 inches and cut the cheesecake into bars for serving. If you want to use a round pan so you can cut wedges, choose a 10 inch pan. Huh? Well — 7 x 11 = 77 square inches for the rectangular pan. Pi x Radius squared for the round pan would be 5 x 5 = 25 x 3.14 (pi) = 78.5 square inches. Close enough. See, that math class wasn’t totally useless after all!! Creamy, rich taste with just right sweetness. Perfect alone or as the base for your favorite fruit. If not using boxed graham cracker crumbs, crush 11 graham cracker rectangles in a plastic bag using a rolling pin or flat object. In medium bowl, combine thoroughly the crushed graham cracker crumbs, sugar and melted butter. Press mixture into bottom of pan and set aside. In large bowl, mix together the softened cream cheese, lemon, juice, vanilla extract and powdered sugar until mixture is light and fluffy. Add sour cream and whipping cream. Beat until mixture is very thick and creamy. Spread filling evenly into crust. Cover and refrigerate for at least four hours or overnight. Serve plain or with fresh fruit. I’m so glad you stopped by today! Follow A Pinch of Joy using the icons on the bar at the top of the page so you don’t miss a thing! I’d love to have your company on this venture!! Share: if you found this helpful or inspiring please click one of the buttons below! Your support of A Pinch of Joy is appreciated!